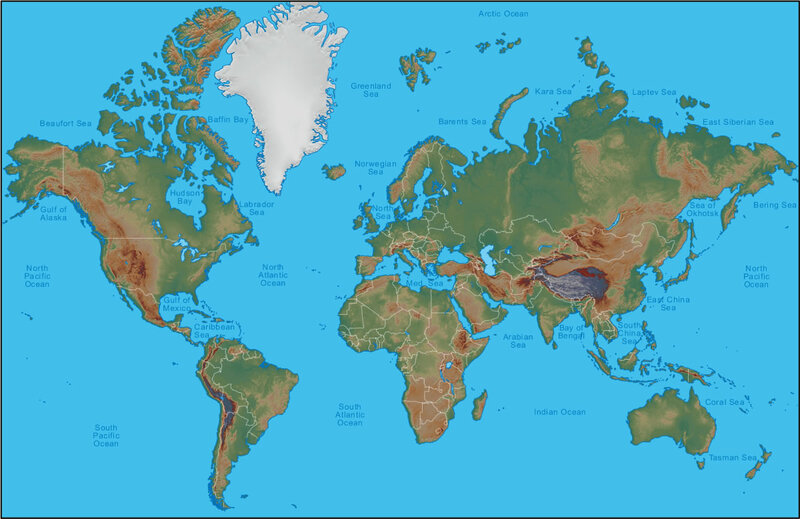 The Gall-Peters map is an “area accurate map” that shows that areas which are equally sized on the globe are similarly equally sized on the map. For example, Greenland which has an area of 2,116, 086 km², and Algeria which has an area of 2, 381, 741 km² are roughly the same size on the map. (Figures taken from nationsonline.org). Using this handy website we are clearly able to see that Greenland and Algeria are roughly the same size. This method of maintaining area accuracy seems like a fairly obvious way to draw maps, so surely the map we have taken as gospel for the last 500 years (the Mercator projection was presented in 1569) would follow such a procedure. The fact is that it does not. The Mercator maps design and creation was for nautical purposes, helping sailors to navigate whilst on the seas. As Gurudev states in his article Why is the popular world map wrong?, Mercator needed to maintain direction, ie if you are sailing and using Mercator’s map for reference “.. you take a straight line in a Mercator’s map and follow it using a compass then you will reach the same place as depicted in the map”. Unfortunately, by preserving direction, he was in fact sacrificing accurate size and area. The equations used to map the navigational straight lines distort the size and shape of large objects so countries are represented as bigger, or smaller, than what they truly are. Those objects closer to the equator are distorted to a smaller size, and those further away are enlarged. This is best explained through returning to our example of Greenland and Algeria. As we know, these countries are roughly the same size in terms of area, and yet on the Mercator map look how out of proportion Greenland is, (Greenland is the white land mass on the map). 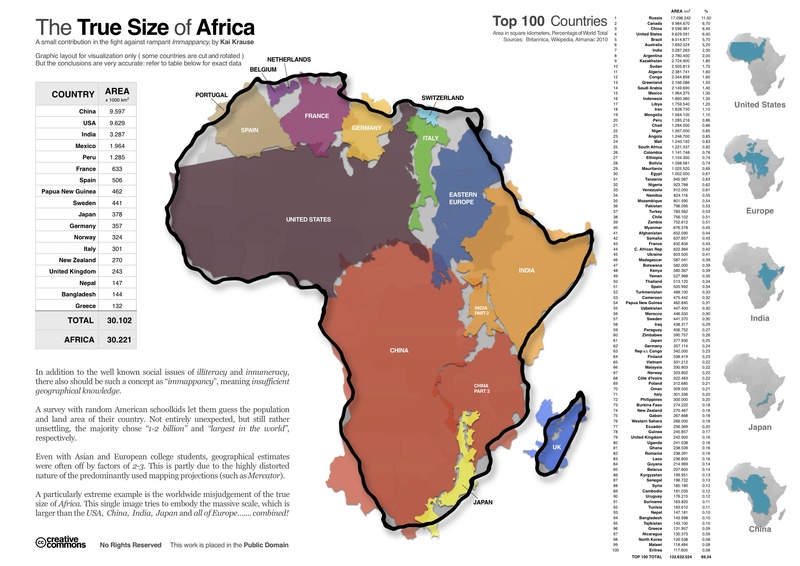 It appears to be the same size, if not bigger, than the entire continent of Africa. This point was made when the fictitious Organization for Cartographers appeared on an episode of the TV show, The West Wing. They explained that the distortion from using Mercator projection maps inflates Greenland to a size bigger than Africa. Whereas in reality the continent of Africa is fourteen time as large. It is true that on all map projections, sizes and shapes will be distorted to a certain extent because it is impossible to accurately portray a spherical shape in rectangular form. However the Mercator map has an abundance of obvious flaws to it. Due to the inherent exaggerations many errors are upon the map. Brazil and Alaska appear to be the same size when in fact Brazil is almost five times larger. Finland is portrayed as longer from North to South than India, but in reality India is longer. Not only does the use of the Mercator projection teach generations of people incorrect information with regards to country size, perhaps leading to many fatal errors in local pub quizzes, it also has more sinister implications. Mapping is an obviously difficult task, and no map is ever going to be perfect. Different maps suit different purposes after all. The near, worldwide adoption of the Mercator projection has proved to be very problematic. If it had remained as a purely navigational map then perhaps it may not have become such an issue as it is currently. Its original usage and purpose, as stated earlier, was for navigation, it was not geopolitical. The continued use of the Mercator projection outside of navigational purposes has led to a number of criticisms. One of these is that the Mercator projection reaffirms European imperialist attitudes. It was designed at a time of great European power when nations looked to colonise and “enlighten” those that were considered inferior. In all probability Mercator did not create the map to show European and White superiority over the rest of the world, but this was the message that was given for hundreds of years because it was used outside of a navigational context. The lesser developed countries, those that were colonised by the European powers, are smaller on the Mercator map and so appear inferior. The distortions of the map inflate the size of certain nations and so increase their importance. The inflated size of the countries fits nicely with their inflated ego, and their belief that they were better than the rest of the world. By portraying lesser developed countries as smaller than they actually are, it instils a sense of weakness and insecurity. Once it had been adopted in the wider world, it proved hard to shake and the trend continued. Generations of Westerners have grown up believing the Mercator map to be completely accurate and true. As Currie states, perhaps we have perception difficulties, we are “displeased with the different appearance of the [Gall-]Peters projection” and “feel more comfortable” with Mercator. This comfort though, comes with the price of accepting the inherent political message of the map. The inferiority of the African and South American states, and the enlarged size of the White nations. Like Abu-Meizer, I believe that maps “truly influence the perceptions individuals might have about certain countries” and when we accept the usage of one map over another, we accept the unconscious political message that comes with it. Who is at the top of the world? Who is at the bottom? Who is the largest, and most important? Who is the smallest, and least important? To truly understand the issue here we have to put ourselves in the places of those countries we have understated and misrepresented. How would we feel if after the horrors of colonialism and slavery, our countries were then systematically and repeatedly portrayed as smaller than they actually are. Not only factually inaccurate but hugely disrespectful. The continued use of the Mercator map is further evidence of inequality in this world and of a belief in Western, white culture and history being superior to that of any other. There are people and organisations that are taking steps to correct this though, Oxfam and New Internationalist are just two that have given up Mercator maps and adopted Gall-Peters projection. By choosing to drop the Mercator map we can take another small step towards reconciliation. The use of the Gall-Peters projection looks to restore the poorer, less developed countries to their rightful size and stature, giving greater prominence and significance to those countries we have historically viewed as lesser.